We provide a comprehensive power-flushing service throughout Liverpool. Contact us for a bespoke price: 0151 438 2297. Prices start from £200. Power flushing is the process of removing sludge, rust and other materials from your central heatings circulation. Over a long period, this matter builds up which can lead to many other problems. Hot water temperature has reduced over time. The boiler or components, mainly the pump, become noisy or fail. Particular radiators have stopped working or develop hot spots. For example, only the top half is warm. Your central heating system begins to take progressively longer periods of time to warm up. Power flushing is especially useful for older central heating systems in which you may begin to see a reduction in performance with. It is also an excellent idea when having a new boiler installed as you will see a much better result and will avoid sludge and rust, among other materials, flowing through your new boiler. This will extend the life of your boiler ensuring you receive its maximum operational life. We recommended you power flush your system once every 7 - 10 years. 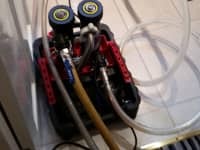 We also use a MagnaCleanse as an extension onto the power flushing machine which gives us even improved result when flushing. It also allows us to show the customer the rust and other elements contained within their central heating system once the radiators have been agitated. Protect your pipework, radiators and boiler from multiple materials, such as sludge and rust, damaging your system. Reduce your energy bills. You may use less fuel to warm your home/business. Less chance of requiring repairs. If you keep your system in good condition, you will reduce the likelihood of needing repairs in the future, some which can run into several hundreds of pounds. There are regular cases of customers requiring a new boiler due to the cost of replacing multiple parts being no longer economically viable. 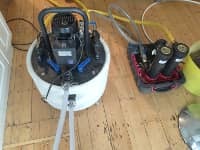 An engineer will attend your property with the power flushing equipment. We use high quality/performance and safe equipment. The engineer will attach your central heating system up to the power flushing unit and will begin the flushing. This can take up to 6-8 hours. It solely depends on the size of your central heating system. An engineer is required to be on site during the entire flushing process to ensure proper operation of the flushing unit. 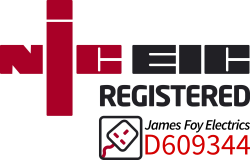 Also, it is essential for an engineer to be on site in case poor pipework in your home fails allowing to stop the flush rapidly and rectify the problem. Our engineers have multiple years of experience and will guide you through the whole process. Contact us today on 0151 438 2297. The highest quality of pumping unit will be used. At all times, dust sheet will be placed around your home. Our engineers will be happy to explain the process and whats being done. Our engineers will treat your home like their own. A certified, trained engineer will carry out the power flushing. The engineer will be on site the whole time. This is critical for safety of your home. No hidden costs. The power flushing quotation we provide will be final. 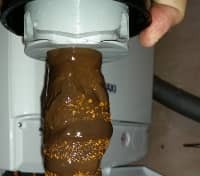 We will be happy to show you the thick black sludge leaving your heating system! Q: Can you provide remedial work on site if required? A: Absolutely. If you need a new TRV (for example) fitting during the process, we can accommodate this. We will confirm costings with you beforehand, and it will be directly added to your invoice. Q: Will a member of staff be on site all day? A: Yes. A member of staff will be on your property during the whole power flushing operation. Q: Do you use high quality power flushing systems? A: Yes. Our system is also piggybacked onto a MagnaCleanse system for better results. Q: Will you provide a report documenting our system has been power flush for insurance purposes? A: Of course. Just ask a member of staff who will generate a small PDF for you in digital format. You can then forward onto your insurance company or print off. A: Of course. We have full public liability insurance with a major insurance company. Q: Do you power flush each radiator? A: Yes. This is the correct way to do it. Many companies do not bother! Our power flushing service is available to all areas of Liverpool (Merseyside), Wirral, St. Helens, Knowsley and Sefton. Please click expand to view a list of areas our service applies to. If you are not sure, please give us a call.